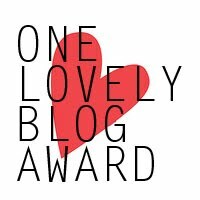 Lippy Lucie: One Lovely Blog Award!! Ahhhh you guys are too cute! I received this award today from Anna at ﻿Anna's Dope Blog! I am totally flattered and again really chuffed that people are reading my blog and enjoying my nail art! I hate fridges. I dislike the smell and am often scared to open one in case there is smelly food in there!! Ew. My absolute favourite movie is Titanic, i have probably watched it over 50 times and once more last Friday in 3D. I will never let go.. I have a freckle on my nose called Claire. I am a little OCD when it comes to shopping for things. I cannot pick the thing at the front of a shelf or the thing I have first touched, and I simply won't buy it if it is the last one - for fear of contamination!!! I am addicted to other peoples blogs. I feel like have actually become a stalker with some people.. I just LOVE their lives!!! !